Governor Deval Patrick has proposed taking in as many as 1,000 unaccompanied children who have illegally crossed the US Mexico border. In Massachusetts and across the country, residents have balked at the prospect of hundreds of immigrant children coming to their towns, angry that public money is being spent on illegal immigrants and worried that the influx would burden local schools and social services. Yet the federal government insists the impact would be minimal, and many immigration lawyers and advocates describe the emergency shelters established in other states as worlds apart, secure, secluded facilities that quietly serve as way stations for thousands of young migrants. In one California city where an emergency shelter opened in June at a naval base, the effect on the broader community has been negligible, the mayor says. 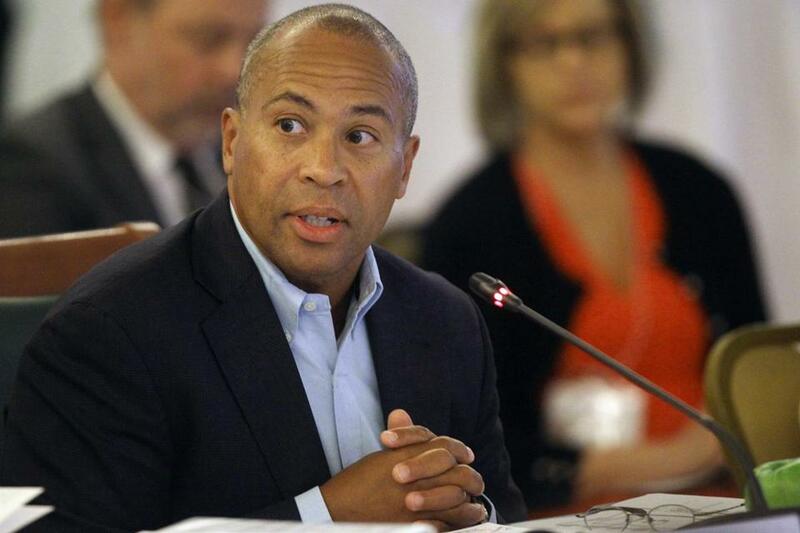 Governor Deval Patrick has proposed taking in as many as 1,000 unaccompanied children who have illegally crossed the US-Mexico border, identifying as potential sites the Westover Air Reserve Base in Chicopee and Camp Edwards on the Cape. Voters split on sheltering migrant children in Mass. Government officials say the immigrants would not be allowed to leave the facility during their time there, and neither communities nor the state would be required to shoulder any costs. In response to the influx of migrant children, the federal government already has created temporary housing on three military bases, in Texas, Oklahoma, and the one in California. But with more than 57,000 unaccompanied children apprehended at the border since last fall, federal officials have been scrambling to find more space. Most of the children come from El Salvador, Guatemala, or Honduras, fleeing violence from gangs and drug cartels. The children stay in the shelters until they are processed by immigration officials. The average stay is about a month, about half as long as it used to be, advocates say. With limited space, the pressure to place the children with a relative or family friend has intensified, they say. The US Department of Health and Human Services, which operates the shelters, says it “pays for and provides” all services for the children, including food, clothing, and medical screening. “Clothes and essentials are provided by the shelters,” said Kenneth Wolfe, a spokesman for the agency. The children are not allowed to leave or have visitors, although attorneys and medical staff visit shelters several times each week, Wolfe said. But many are skeptical that the federal government will cover the full cost of the facility. At a meeting Tuesday night, selectmen in the Cape Cod town of Bourne said housing children there would unfairly burden the community, and that money should be spent on Americans. “We need to take care of our own first,” said Peter Meier, chairman of the town’s board. The influx of Central American children in recent months has already been felt in a number of Massachusetts cities, notably Chelsea, Lynn, and New Bedford. So far this year, more than 770 unaccompanied children have been released to family members or other guardians in Massachusetts. In Connecticut, the governor has said some 320 immigrant children have been placed there. The Defense Department has authorized the facilities to stay open for four months. Health and Human Services does not know when additional housing will open, and Patrick said the federal government may decide not to use either Massachusetts location. Advocates for immigrants have raised concerns about how the emergency shelters are being run and whether the children are receiving proper legal advice, given their numbers and relatively short stays. The children need a lawyer to help them navigate the immigration process and eventually represent them at a hearing on their status. Before the recent crisis, the government used about 100 short-term shelters for children who enter the country without a parent. But with the recent surge of migrants, those smaller shelters were overwhelmed, forcing the government to open the temporary facilities. Children are transferred there from the border within three days. At the shelter, children are given a health exam and all childhood vaccinations. If they have mental health problems, they are transferred to a specialized facility. Advocates said that about 90 percent of the children are released to relatives or family friends within 35 days. About 10 percent, who have nowhere to go, are placed in some foster care. But the location of the temporary facility has no bearing on where they wind up. “That’s not going to make them stay there,” said Julie Flanders, an immigration lawyer in Texas with Justice for Our Neighbors, a network of clinics that provides legal assistance to immigrants. Flanders, who has visited the emergency shelter at Lackland Air Force Base in San Antonio, Texas, said the immigrants are carefully overseen, with children broken into groups with chaperones. Caseworkers meet with the children to gather contact information, while lawyers ask questions about their history to determine if they have a case to stay in the country permanently. About half do, she said.